Use this simple, but powerful, 3-part framework to get people to open up honestly, prevent blow-ups, de-escalate uncomfortable, emotional situations – and get the positive outcome you want. Difficult conversations never get “easy” because they inherently involve confrontation no matter what the topic. People’s reactions make difficult conversations unpredictable. Often high stakes conversations get “sprung” on the manager. Most difficult conversations are emotional. Most people have never been coached to have these conversations with the right balance of empathy and assertiveness. Read #5 again. That fact is the most damaging. You need a plan, and the right tools and countermeasures to navigate the rocky terrain of difficult conversations in the workplace – and the hidden landmines that lie within. That's exactly what you get with the ResourcefulManager 3-Part Framework for Conducting Successful Difficult Conversations. 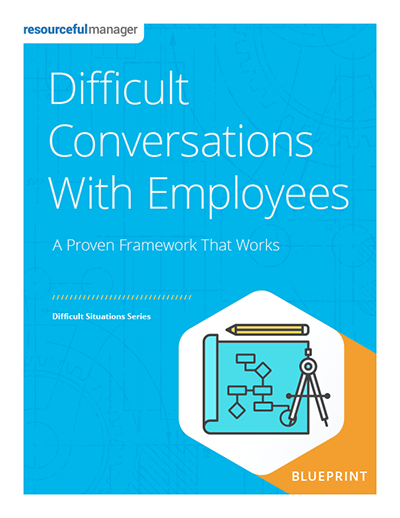 Should you document every difficult conversation and get the employee to sign it? A misstep at any of those three stages will seriously reduce the chances of arriving at a successful outcome. Armed with this 44-page Blueprint, 3-part framework and practical tools you now have everything you need to navigate the emotional and ominous minefield of difficult conversations with consistently satisfying results for you the other person. ResourcefulManager's "Difficult Conversations With Employees" Blueprint comes with an unconditional, 100% money back guarantee.